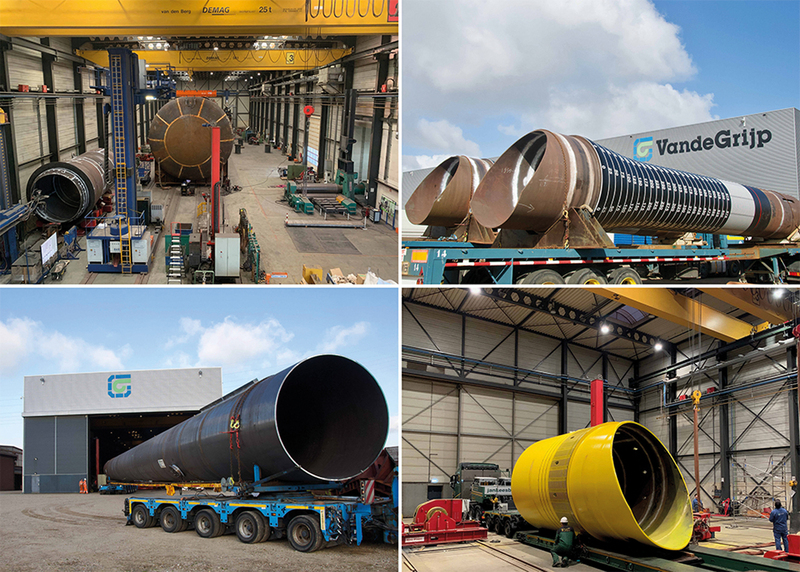 VandeGrijp is an independent company specialized in production of steel tubes, piles and tubular constructions made to customer’s specifications. VandeGrijp excels in production of heavy steel constructions. Our expertise ranges from fabrication of tubes, tube sections, cylinders, cones and half scales to complete winch drums, transitions and spreader bars. With more than 8,000 square meters of fabrication halls, our own harbor with roll-on roll-off quay at our property of more than 8 hectares, we can help you fabricate virtually anything. From unique special items to larger series, in high tensile or normal steel, we deliver quality on time. The company operates according to ISO 9001 and ISO 3834-2 specifications and is EN-1090 EXC4 qualified. - Pipe mill with a six-meter plate rolling machine for pipe diameters up to 1200 mm and 25 mm wall thickness. - Two construction halls with three 3-meter plate rolling machines, for plate thicknesses from 10 mm up to 150 mm and diameters up to 10,000 mm and assembly lengths up to 150 meters. - Harbor with RoRo loading quay for large and heavy constructions in close proximity to Rotterdam.